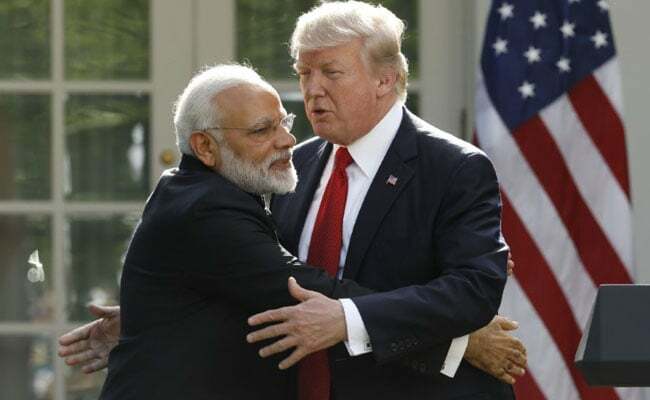 Washington: U.S. President Donald Trump urged Indian Prime Minister Narendra Modi to do more to relax Indian trade barriers on Monday during talks in which both leaders took great pains to stress the importance of a strong U.S.-Indian relationship. At a closely watched first meeting between the two, Trump and PM Modi appeared to get along well. Modi pulled in Trump for a bear hug on the stage as the cameras rolled in the Rose Garden. Trump was also warm but made clear he sees a need for more balance in the U.S.-India trade relationship in keeping with his campaign promise to expand American exports and create more jobs at home. Last year the U.S. trade deficit with India neared $31 billion. “It is important that barriers be removed to the export of U.S. goods into your markets and that we reduce our trade deficit with your country,” he said. Trump said he was pleased about an Indian airline’s recent order of 100 new American planes and that the United States looked forward to exporting more energy, including major long-term contracts to purchase American natural gas. These energy contracts “are being negotiated and we will sign – trying to get the price up a little bit,” Trump said. PM Modi came to Washington looking to revitalize a relationship that thrived under former President Barack Obama but has appeared to flag as Trump courted India’s rival China in an effort to persuade Beijing to do more to rein in North Korea. Trump accepted PM Modi’s invitation to visit India, the White House said in a statement, but no time frame was given for the trip. PM Modi harked back to Trump’s “Make America Great Again” campaign slogan to stress that his agenda for his country was little different than Trump’s. “I am sure that the convergence of my vision for “New India” and President Trump’s vision for making America great again will add new dimensions to our cooperation,” he said. Trump did not mention U.S. differences with India on immigration and the Paris climate accord. “The future of our partnership has never looked brighter,” Trump said as both leaders underscored the importance of the defense and security relationship. As they met, a Pentagon agency said the U.S. State Department has approved the possible sale to India of a Boeing C-17 transport aircraft with an estimated cost of $366 million. The United States also has offered to sell a naval variant of the Predator drone made by U.S. defense contractor General Atomics Aeronautical Systems, the White House said in a statement, a deal that would be worth more than $2 billion. The United States has become the leading supplier of defense equipment to India, signing contracts worth more than $15 billion since 2008. On Monday evening, Trump and PM Modi had a working dinner, the first time Trump has played host to a foreign dignitary at a White House dinner. Trump administration officials have pointed to both leaders’ impact on social media – each has more than 30 million Twitter followers – as proof they are cut from the same cloth. Trade, however, remains an irritant, and on Saturday, leading U.S. congressmen complained in a letter to Trump that high-level engagement had failed to eliminate major barriers to U.S. imports and investment and had not deterred India from imposing new ones. Indian officials reject suggestions that PM Modi’s “Make in India” platform is protectionist and complain about the U.S. regulatory process for generic pharmaceuticals and rules on fruit imports. Among the Indian business executives in Washington for PM Modi’s visit was Ajay Singh, chairman of Indian budget airline SpiceJet, which in January announced a deal to buy up to 205 aircraft from Boeing, worth up to $22 billion at list prices. Singh told Reuters that according to the U.S. Department of Commerce, the deal would sustain up to 132,000 jobs. “As our economy grows … we can potentially create a lot of jobs for Americans in the United States,” he said. Boeing has estimated India will need 1,850 new aircraft worth $265 billion by 2036 to meet demand for air travel.